14U Not playing on high school teams April 29th. 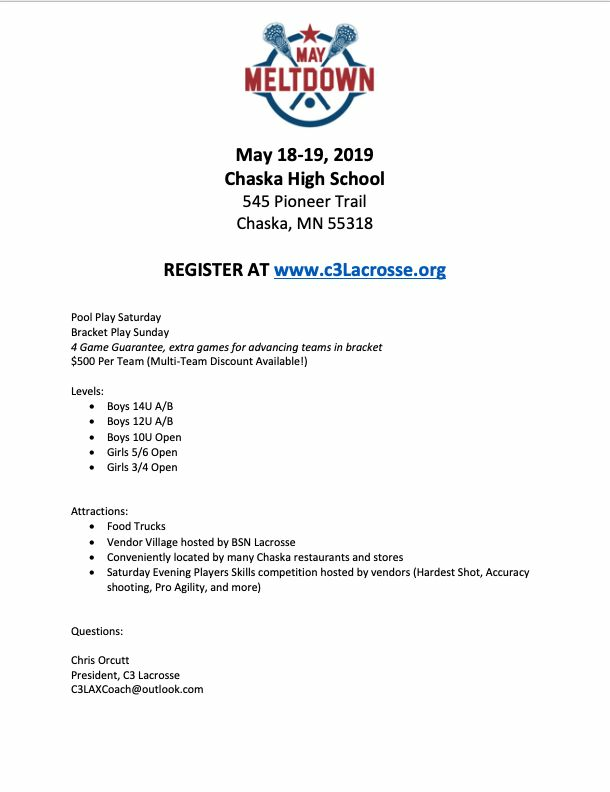 12U Monday April 22nd & Tuesday April 23rd Evals Chanhassen Upper Turf 6:00 PM, practice April 29th. Attached is the uniform sizing link to input your child's uniform size as well as the option to purchase StormHawk branded clothing. Some teams might start later. Teams with practices should take extra and longer water breaks. Up to 89° Normal Play, but coaches should watch for signs of heat reactions and substitute accordingly. Players should be encouraged to remove helmets and drink extra water. 90° - 99° Mandatory one-minute water breaks per quarter. Each quarter should be shortened by one minute. Game clock and any penalty clocks should be stopped during water breaks. Officials should remind teams there should be no coaching during water breaks. Players should take off their helmets and pour water on their heads in addition to drinking it. 100° - 105° Mandatory two-minute water breaks per quarter. Each quarter should be shortened by two minutes. Game clock and any penalty clocks should be stopped during water breaks. Officials should remind teams there should be no coaching during water breaks. Players should remove their helmets and pour water on their heads in addition to drinking extra. Players should be encouraged to drink extra water throughout the day before the game and when they return home after the game.